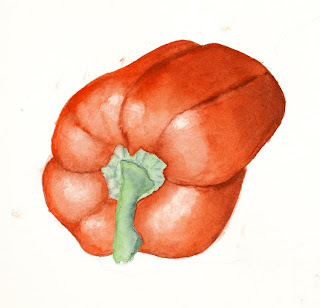 I don't consider this red pepper complete but I may just stop here. Using Rublev mineral reds to darken the Cadmium Scarlet became difficult to control as further washes disturbed the minerals. I'd forgotten how sensitive these pigments are. I think they're best used for one application only. And there was more to learn from this study as I became sensitive to nuanced shading to portray roundness. Sometime soon I can see pigment studies--for instance, laying out all my reds by temperature in value ranges with tests for transparency and staining.